Ocean pollution is a kind of pollution about which we cannot forget. Because, at the end or ultimately all pollution tends to get reach the ocean, contaminating it to a very great extent. We shall detail about Ocean pollution here with the causes or sources of it with few preventive measures to reduce ocean pollution. One of the majestic sights in this world is that of the ocean. Just like being in a forest or on the top of a mountain, standing before an ocean, on a sandy beach fills one with awe. The power and the roar of the sea fills one’s senses, calming the spirit and then you feel everything is is still good in the world. But is everything right with the oceans? No it is not, yet the ocean is like a defiant woman who still roars, still trying to protect and provide for those who are dependent on her, paying scant regard for the damage that has been afflicted on her. The earth has many resources. The oceans are the most vast and abundant. They provides home for hundreds of species from the smallest to the largest animal in the world. By its currents and continuous movement, it distributes temperatures evenly all over the earth. From the power of its waves and deep currents energy is harnessed for generating clean power supply. It is a transportation channel with many thousands of ships carrying every kind of goods to and fro between countries. It has not been spared of the polluting activities of humans. It was considered so vast that people thought that they could dump into it and it would make no difference. Recent discoveries have shown that accumulation of garbage has severe implications on all the ecosystems not just the oceans themselves. 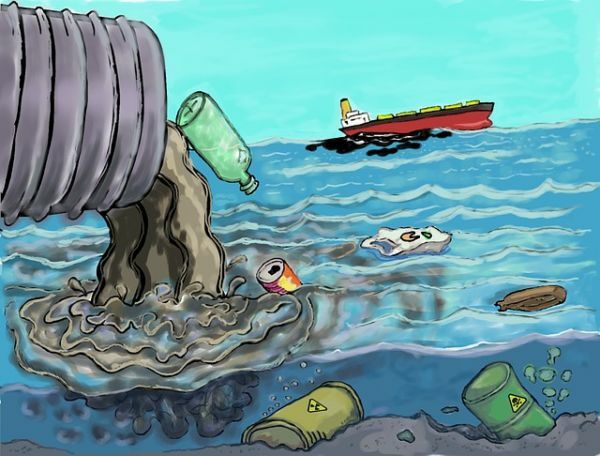 Introduction of harmful substances that are not normally found in the ocean adversely affecting the aquatic environment and its inhabitants is called Ocean pollution. How are we polluting the ocean? Marine debris- This constitutes the manufactured or processed solid waste material that enters the ocean environment from any source and persists there. Components of marine debris are Plastics, glass, Styrofoam, rubber, derelict fishing gear and derelict vessels. The top three items found are cigarette butts, plastics bags and food wrappers and containers. Dumping activities in the water by vessels including small power and sail boats, large transport ships carrying people and goods, offshore drilling rigs and platforms and fishing piers is so common and adds to the ocean debris. Chemicals such as fertilizers, pesticides, industrial effluents, detergents, chemical cleaning solvents, pharmaceutical chemicals and drugs, etc run off from the land with rain water and reach streams and rivers. From here they are transported to the oceans. Undigested pharmaceutical drugs have been found in fish. Plastics are not biodegradable. They are made of chains of polymers. Large pieces of plastics simply fragment into smaller pieces as small as confetti and sometimes smaller. But these are still polymers. These are also carried off by wind and water. Plastic debris enter the ocean from one point and are carried away by currents and dropped off at beaches very far away from the source. Oil spills though infrequent cause very large scale damage to the ecosystem. This occurs from damaged oil tankers, drilling rigs, offshore refineries. If an oil spill occurs on land , it still reaches the ocean finally. The oceans have been the dumping ground for radioactive wastes from many countries. These may be sealed in heavy containers but the effect of current and chemical in the oceans on the sealed containers can lead to leakage and radiation pollution. The beautiful beaches of many countries even uninhabited island are spoiled by the debris that floats onto them. Pollution is not always seen in the physical realm. Underwater noise pollution is an important factor to be considered. In large bodies of water sound waves are carried undiminished for miles. Persistent sounds from ships , sonar devices, oil rigs, and even from natural sources like earthquakes can disrupt the migration, hunting, communication and reproduction patterns of many marine animals. Ocean pollution is the child of land pollution in a way. That is the contamination of ocean starts from the land. The wash off all waste from the land is taken to the sea making the sea the worst. All other kinds of pollution such as air or environmental pollution are also the add-ons for the ocean pollution. Preventing land pollution: As we have seen the land pollution is the major source of ocean pollution, it is land that has to be kept clean before we make a move towards eradicating ocean pollution. We don’t actually see a decrease in pollution but what we see is a steep rise in the pollution rate. Thus preventing land pollution is the best way to prevent ocean pollution. Recycle- As per the studies conducted in US, around 15 billion plastic are being produced, whereas only 1 billion is being recycled. Does that sound irritating? This implies that the remaining 14 billion is being spilled around on land and ocean. Those spilled on land is also being washed out to oceans. Do our oceans and the aquatic life can bear 14 billion plastic? A local beach cleaning, local stream cleaning can help a lot than you think. Getting your friends and relatives can be much more fun than organising a night party. Each citizen has the responsibility of keeping his environment clean and fresh. It is not another person’s responsibility alone to keep our Earth green and tidy. When each one extends and fulfils their duty of preventing pollution, then we can at least dream of a green earth.